Home Parker Community Technologies Electromechanical Group Electromechanical Knowledge Base The AC890PX DC bus voltage is extremely high on power up. Why? This can mean the Y-caps are creating a voltage multiplier. This can be a result of the AC890 being used as an AFE (Active Front End). This can occur if the drive is connected to a transformer with "Open-Delta" or "Corner-Grounded Delta" windings. The Y-Caps can be disconnected. Removal of the 'Y' capacitors invalidates conformance to the EMC standards stated on the Declaration of Conformity in the product manual. The CE mark remains on the product as this is for product electrical safety. Remove power to the 890PX. 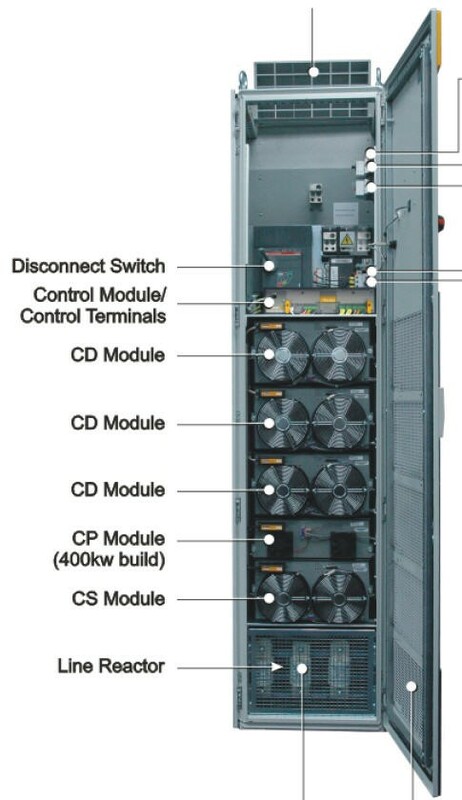 Locate the 3 CD Modules (Output Modules) as each one will have to be removed, to be modified. Remove one of the three CD Modules. To remove the CD Module unplug the cables from the front of the module. Unscrew the left screw 5 turns then unscrew the right screw 5 turns. Repeat this procedure until the module is removed. The module screws need to be removed evenly, thus do not exceed 5 turns per screw at a time. Once removed rotate the module, to view the back of it as shown below. Locate the EMC Capacitor jumper as shown below. It is in the top middle of the CD Module. With a set of needle nose pliers, grab a hold of the metal jumper, and completely remove this metal jumper. Reinstall the module into the 890PX. Keep in mind the 5 turns per screw, at a time procedure. See step 3. Repeat this procedure for the remaining 2 CD Modules.